Earlier this week I got a free evening to use some off camera flash at Downhill Beach. This was in preparation for beach workshops which I hope to be running very soon. 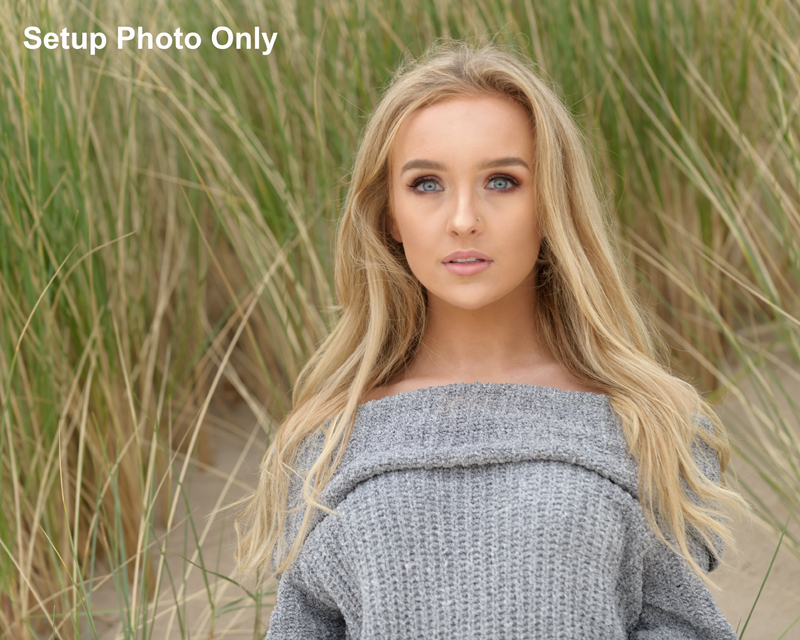 These workshops will be evenings at Downhill Beach from 7.30pm to sunset, with a professional model. If you would be interested in a place on one of these beach evening workshops please get in touch here. Big thanks to Lauryn for modelling, and her dad, Tommy who came along also. Tommy is a great photographer so he brought his camera too. We were fortunate to have an evening with no rain, however given the sunshine evenings recently, we had to settle for a cloudy and overcast evening. Here’s a selection of photos from the evening. This was our starting point. The sky was overcast, which produced very flat and low contrast natural light. Here I exposed for the natural light and added a soft fill light from front camera right to give some direction to the light. To help lift from flat natural light, I also added a warm gelled back light to warm up Lauryn’s hair and surrounding sand. The second setup was an easy follow on from the first. I simply asked Lauryn to stand up, and repositioned the height of both lights to match Lauryn’s height now she was standing. Identical to the above standing photo. This is simply a zoomed in head shot of the same setup. Next we moved along a few yards and asked Lauryn to sit on the sand again. Here I added a gelled back light behind onto the beach grass to give it a warm tone and some direction/shape/shadow to the light. 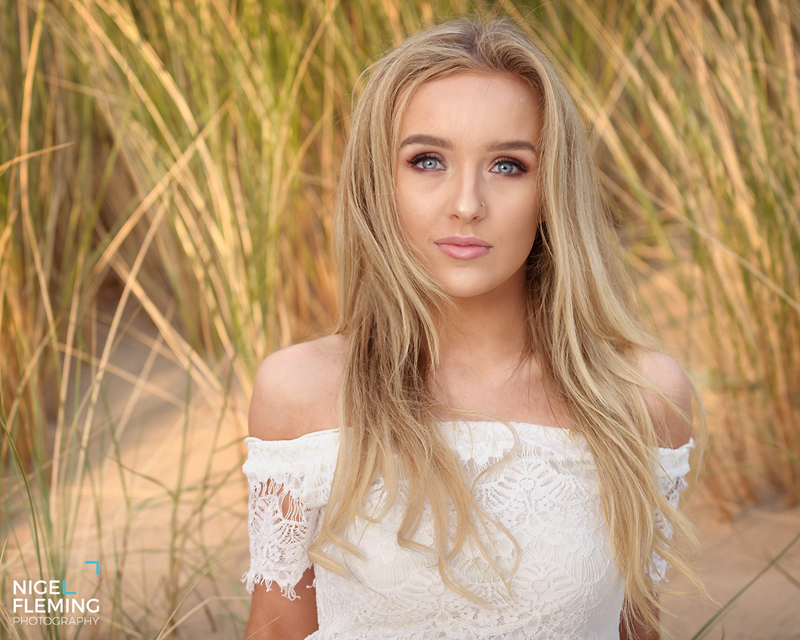 Lauryn was positioned very close to the background grass, so the back light had to be tightly controlled so as to light only the grass and sand and not Lauryn! Soft fill light added from the front. This is a setup photo for the above. This shows the grass colour in the background before flash was added, and the reason why I added flash. (Compare with the previous photo). This was similarly using a two light setup, but a change in camera position to provide a darker background. It’s not obvious looking at the photo that there’s a main road and a railway line running behind, between the beach grass and the hillside. This was on a 70-200mm lens which compresses the background to appear much closer. This was the final setup of the evening. I had been keeping an eye on the overcast sky most of the evening, hoping for a break in the cloud and some late sunshine. It didn’t really happen and this was as good as it got, so we headed quickly down to the shoreline before the light disappeared. In keeping with the same lighting, two off camera flashes were used here. Flash gel and a suitable camera white balance were used to warm the scene. If you would like to attend an off camera flash evening at Downhill Beach then please get in touch here.